Phase Two Support from Art Department, Carnage, Fedde Le Grand, Galantis, Matador, Nic Fanciulli, Thomas Jack, W&W + Many More! 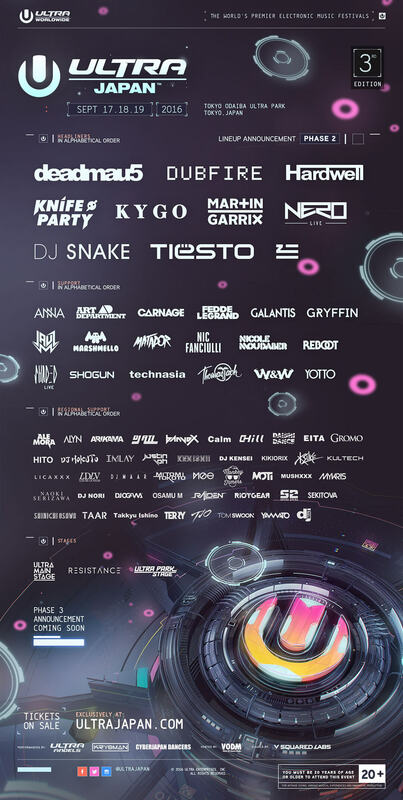 Following a huge Phase One lineup announcement back in May, ULTRA Japan, the country’s largest ever electronic music festival, now reveals an even more impressive Phase Two roster brimming with A-list talent from across the dance music spectrum, as it prepares to host its third edition this September 17-19, 2016. Adding to the list of already confirmed headliners (deadmau5, Hardwell, Martin Garrix, Nero (Live), DJ Snake and Tiësto) are four more world-class acts, all of whom will be making their ULTRA Japan debuts. Techno kingpin and SCI+TEC label boss Dubfire will be leading the charge on the RESISTANCE Stage, while heavy-hitters Knife Party, Kygo and ZHU will entertain fans with their eclectic Main Stage performances at the Odaiba Ultra Park, Tokyo in just over a month’s time. A further FIFTEEN acts have been added to the list of Phase Two Support, with Carnage, Fedde Le Grand, Galantis, Gryffin, Shogun, Thomas Jack and W&W joining Jauz and Marshmello on Main Stage duties, while Anna, Art Department, Matador, Nic Fanciulli, Nicole Moudaber, Reboot, Shaded (Live), Technasia and Yotto will be throwing it down on the RESISTANCE Stage. If that weren’t enough, over forty more regional support acts have been confirmed, completing the ULTRA Japan Phase Two Lineup, which you can see in full here. ULTRA Japan will mark the end of ULTRA Worldwide’s historic second run of shows in Asia this year. With ULTRA Korea and a SOLD OUT Road To ULTRA Thailand event having already taken place in June, part two will see the brand undertake a marathon six stops this September in Singapore, Taiwan, Hong Kong, Bali and the Philippines before finishing in Japan on September 19.